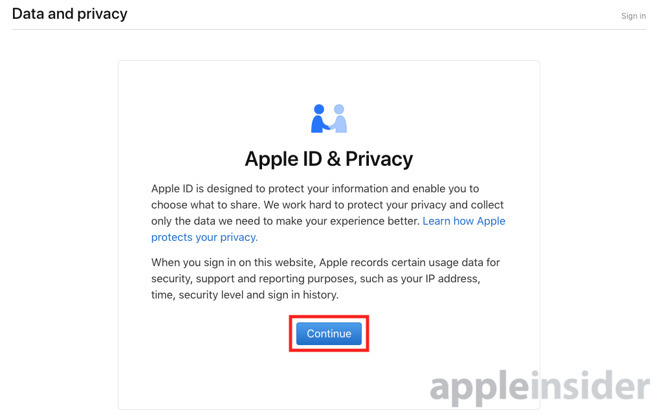 Launched today in response to the European Union's General Data Protection Regulation (GDPR), which will take effect on May 25, the Data and Privacy portal is a one-stop-shop for users wanting to see what kind of personal data Apple has about them on the company's servers. Users can make a request for data, which can then be downloaded and examined. The GDPR includes a requirement for companies to provide its customers in the EU with ways to see what personally-identifiable information the firm has in its possession. While Apple has previously provided data to users by request by other means, including contacting AppleCare, the new initiative considerably simplifies the process for its users. In a web browser, access the new portal, available at privacy.apple.com. 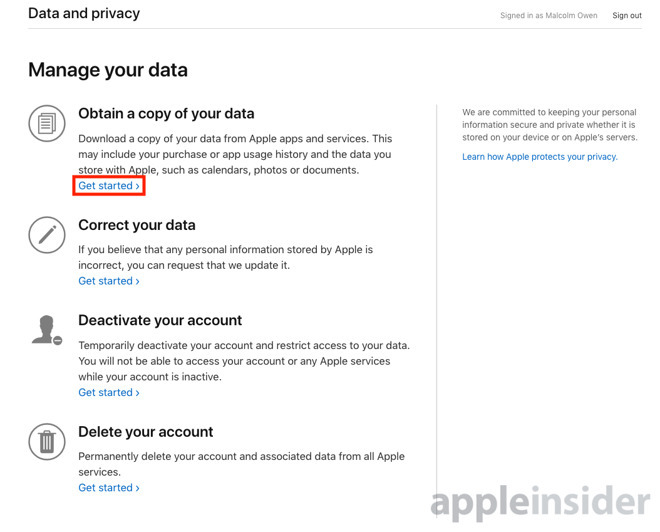 On your first visit, a notification advising Apple records "certain usage data" will appear, as well as a link to a page about Apple's privacy policies. Click Continue. 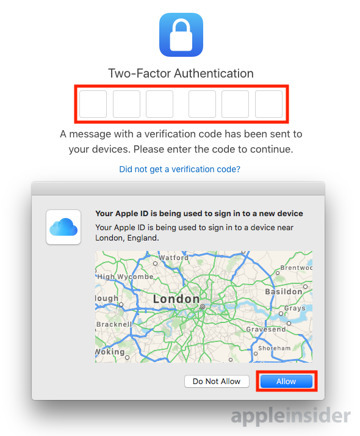 You will then be prompted to log into your account with your username and password, followed by performing two-factor authentication if it is enabled on the account. Enter and complete the authentication process. Once in the portal itself, click the Get Started link in the top section, named "Obtain a copy of your data." In the tool itself, Apple notes the process will take up to seven days to complete, and that it will take time to verify the request was made by the correct user. The page also advises of the formats that data will be provided in, such as spreadsheets and PDF files for app usage and activity information, or the original file formats used for documents and pictures. The page also warns the download will not contain any content purchased from Apple's online marketplaces, including apps, books, films, TV shows, and music. The Apple Online Store transaction history and Marketing communications history will not be included either, but can be requested by following the supplied link. 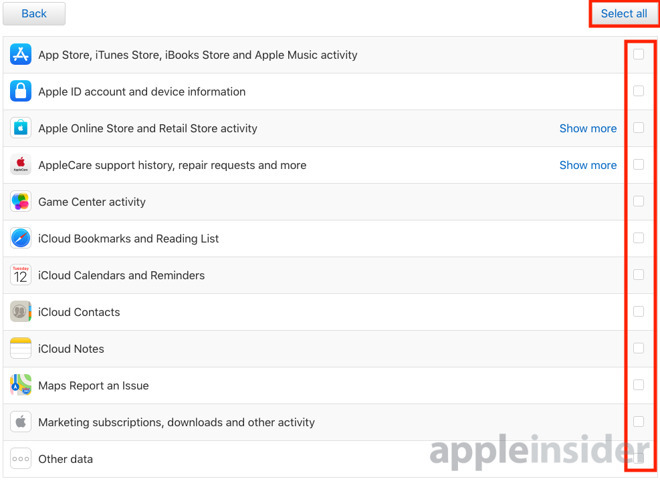 The first large section lists different data categories a user can request from Apple, with tickboxes to the right used to select or exclude certain types of data. A Select All button at the top can also be used if all of the data will be required, as a quicker alternative to clicking each individual section. Further down the page are sections for iCloud Drive files and documents, iCloud Mail, and iCloud Photos. While these can be selected for download, the page warns the items "may be large and take a long time to download," hence the separation from the others. If needed, click the tickboxes next to each. Lastly for the page, click Continue. On the next screen, you will have to select how you want the data archive itself to be constructed. 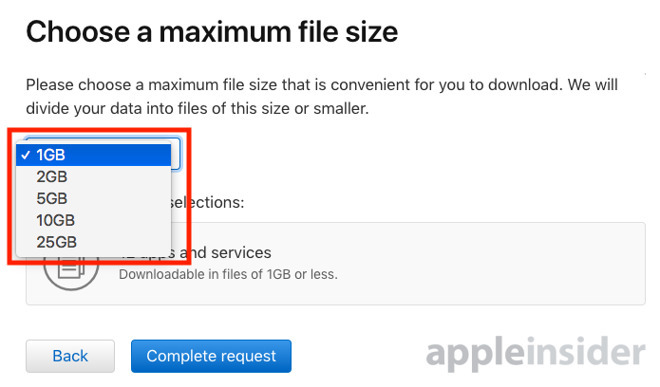 As the archive can be quite large, Apple divides the data up into smaller files that are more easily downloadable for those with more limited connections or storage capabilities. Select one of the size options, ranging from 1 gigabyte to 25 gigabytes. It is advised to go for as high a file size as you can access, in order to minimize the total number of file packages to download. Once selected, review your selections then click Complete Request. 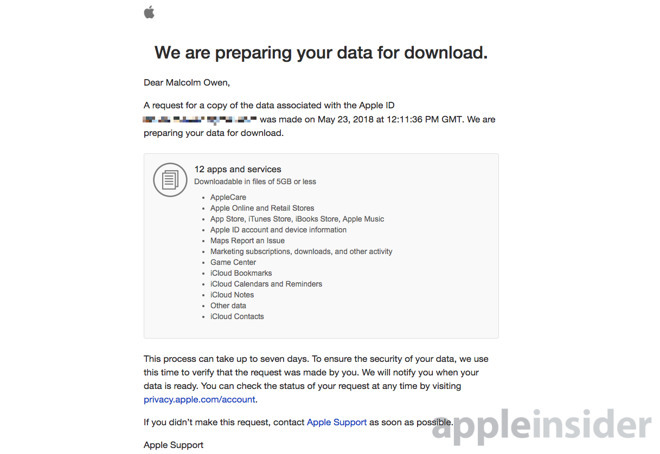 A final confirmation screen will appear, reminding of the seven-day period it could take Apple to compile the download, that Apple will want to verify the request is made by the right person, and that it will notify the account holder at a specific on-file email address. Shortly after submitting, an email will be dispatched to the address, advising of the requested data, the selections, and that a notification for download will arrive in the future. Not everyone will be able to access the new portal at first, as it will initially be available to customers in the European Union, Iceland, Liechtenstein, Norway, and Switzerland. Apple intends to roll out the service to other countries in the coming months, and we'll let you know when it goes live in the U.S.
For those living in areas where the tool is unavailable, Apple advises users can still make requests for their data via other existing means, including its online contact forms.